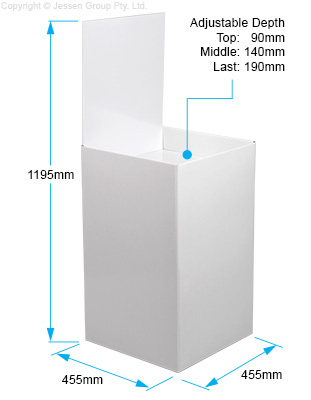 Cardboard Dump Bin Displays - 1195mm Tall - White - Ships Same Day! This product is case packed in quantities of 5 per carton. A break carton fee of $11.00 will be applied to orders that are not placed in case denominations of 5 units. Cardboard dump bin displays are 1195mm tall w/included header attached! Cardboard dump bin displays help you showcase bulk items for customers on your sales floor. 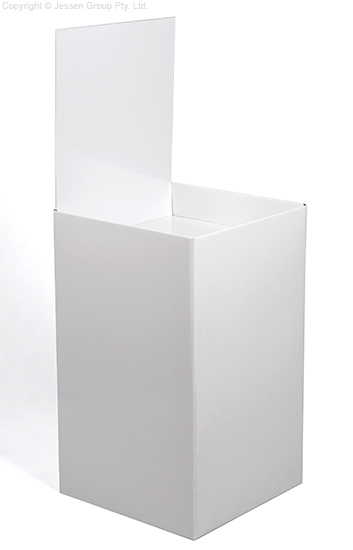 The corrugated retail dump bins feature a large container to accommodate items of different sizes without issue. The interior of the bin is 440 x 440mm, with an adjustable shelf to allow stock to be brought up as it is bought in 3 fixed positions. The lowest position is 190mm from the top, middle is 140mm, and the highest point is 90mm from the top of the container. The cardboard dump bin displays, like many retail store fixtures, has a small footprint to allow various merchandising displays to be used whilst still allowing customers to freely walk around. The display footprint is 455 x 455mm, with an overall height of 1195mm including the large back header. Without attaching the header, the display is 750mm tall. The header itself is 540 x 440mm, perfect for placing promotional graphics or sale information to get customers interested. This entire display is made from gloss laminate corrugated cardboard with a white finish, a striking display that matches any décor whilst being instantly recognisable by customers. The stand sets up in minutes with no tools needed, with each section folding together to ensure stability during use. Great for shopping centres, retail stores, gift shops, and bargain outlets, this cheap store fixture helps move product out the door. This bulk item display stand ships same day to anywhere in Australia when purchased by 2pm EST, buy online from Slimline Warehouse today!